In many-to-many association, a JPA entity has a collection reference of another entity. The entity having the collection reference is called 'source' entity', whereas the entity which is being referenced is called 'target entity'. 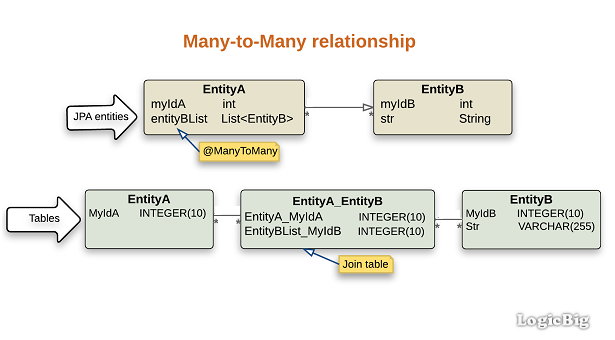 To map many-to-many association to database tables, @ManyToMany annotation is used on the collection. We don't use any annotation on the target side unless it's a bidirectional relationship. An intermediate 'join' table is mapped along with the two tables (each for the source and the target entities). The join table has two foreign key columns. One foreign key column refers to the source table. The other foreign key column refers to the target table. In the join table, there is no unique key constraint on any of the two foreign key columns so that many-to-many multiplicity can be achieved. Having no unique foreign key in the join table also means that our collection can have duplicates and also same target entity can be shared among different instances of the source entity's collection. To use a customized join table or to map an existing join table with different attributes (names/columns), we can use @JoinTable annotation.